The T 36 CROSSOVER was premiered at Boot Düsseldorf 2018 and will be available in Canada in the spring of 2018. 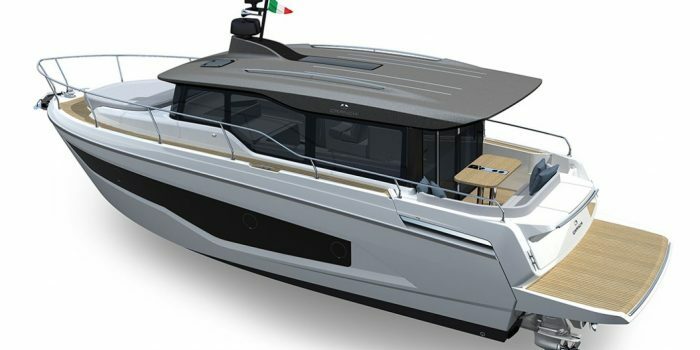 Combining the sensibility of a trawler with the thrill of a sports cruiser, the T-36 crossover can best be described as follows…. At a length of just under 10M, the planing hull ensures remarkable peak speeds, and onboard comfort that far outweighs a traditional cruiser. The comfort is guaranteed by its hard top and the large area underneath in the main deck. This area is totally sheltered by a windscreen that offers comfort and protection, without any barriers to natural light and visibility. A sliding glass door closes this area making it pleasant to stay on board at any latitude, even in hot and humid climates (thanks to the air conditioning system) or in the colder winter months. 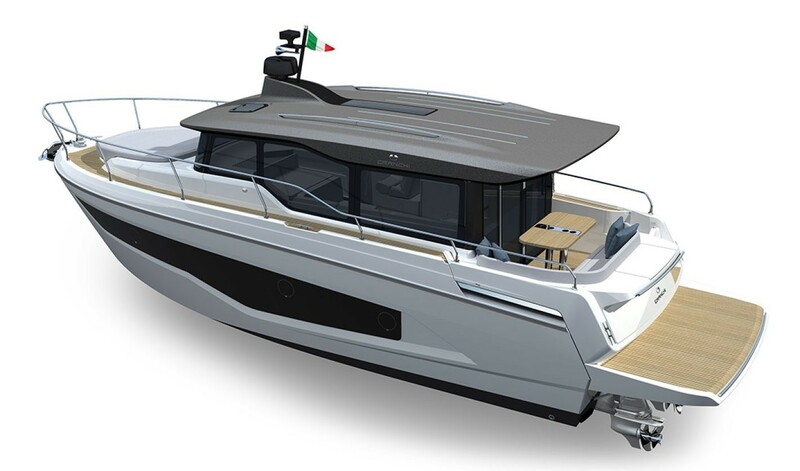 The natural ventilation and good air circulation are guaranteed by the two hatches located on the hard top and facing towards the bow: in non-extreme hot conditions therefore, simply open the door to enjoy the cool. Even with the door closed, there is a sense of continuity with the outdoor area. The cockpit area, both inside and outside, develops on one level without any steps: everything with the T 36 CROSSOVER confirms the idea of an immediate, easy and direct relationship with the sea. In the forward section there is the main sunbathing area, plus there is another one on the hard top, which can be used when the boat is moored. The covered cockpit area houses, in addition to the pilothouse, a lounge with a convertible sofa, and a kitchen. The hard top is an extraordinary example of versatility and can be equipped with locking holders that can accommodate two bikes, or a stand up paddle or a canoe. For information on Cranchi Yachts or the T-36 CROSSOVER, contact any of our yacht brokers. *Taken from the Cranchi brochure.